From Nautilus Magazine, Facts So Romantic: on Matter, Matthew Francis offers up a brief tour of what we know about those mysteries of space, the back hole. No known object in existence has as clear a division between “inside” and “outside” as a black hole. We live and see the outside, and no probe will bring us information about the inside. We can send radio messages or robotic spacecraft, but once they cross over into a black hole’s interior, we’ll never get back those emissaries…or any information about what happened to them. The boundary of a black hole is its event horizon. It’s not a surface in the usual sense—there’s no physical barrier—but it’s very much a real thing. Outside the horizon, an object can escape the black hole’s gravitational pull if it’s moving sufficiently fast; inside, it would need to move faster than light-speed, something forbidden by the laws of nature. In a meaningful sense, a black hole is its event horizon, since we can’t observe anything inside it by any method. The interior is nature’s biggest secret, enshrouded by a barrier that lets everything in but nothing out. To make black holes even more enigmatic, they are also perfectly featureless, according to general relativity, our best explanation of how gravity works. They may be born from situations as different as the deaths of stars and the gravitational collapse of huge amounts of gas in the early Universe, but the result is the same. Even the chemical composition of what gets sucked into and forms it is irrelevant. The only properties a black hole exhibits to the wider cosmos are its mass and how fast it’s rotating. This result is puckishly known as the “no-hair theorem”: Whatever is going on in the interior, no “hair” sticks out of the event horizon. (The name was coined by prominent physicist John Archibald Wheeler, obviously not a man sensitive about a receding hairline.) That theorem presents a challenging conundrum: We don’t know whether a black hole actually deletes its autobiography, “forgetting” its past and its progenitor’s composition, or preserves it somehow in a way we don’t know yet. If that information is destroyed, it’s a violation of one of the principles of quantum mechanics; if it’s preserved, it requires a theory beyond general relativity. The interior of a black hole isn’t merely a an inaccessible region of the cosmos. It’s a laboratory for the most extreme physics: the strongest gravity and the most intense of quantum processes. For that reason, physicists are interested in understanding what goes on inside, even while they are frustrated by the lack of direct experiments or observations that could test their ideas. We can’t penetrate the bald event horizon, but that doesn’t mean we know nothing about a black hole’s interior. 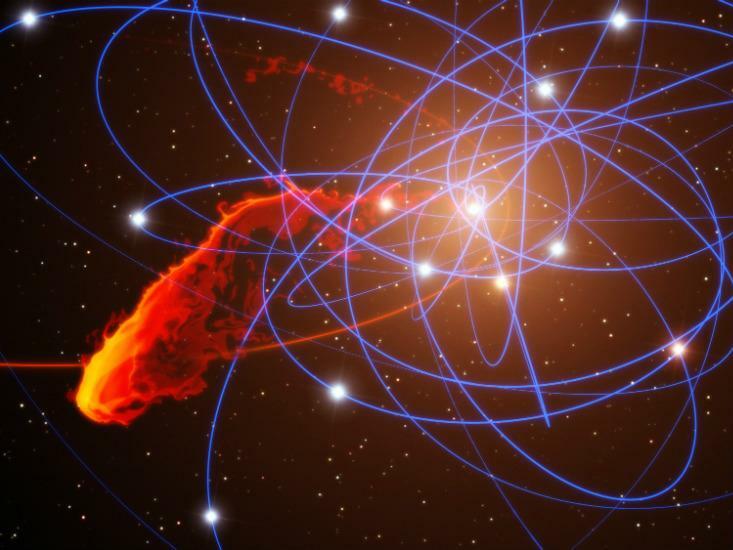 We’re pretty sure black holes don’t contain a portal to another region of space (a wormhole) or another reality, whatever sci-fi may have told us. Most physicists are also reasonably certain that a full description of the interior of black holes will require quantum gravity, a theory unifying quantum physics and general relativity—or possibly a modified version of our current model of gravity. The full structure of such a theory is unknown, but researchers have some thumbnail sketches about what it might look like. One hybrid approach was put together by Yakov Borisovich Zel’dovich, Jacob Bekenstein, and especially Stephen Hawking. Without a quantum theory of gravity, they used particle physics in combination with general relativity to show that the event horizon has a non-zero temperature and therefore glows, albeit very faintly. This glow is known as Hawking radiation; it arises when partnered particles—one electron and one positron, pairs of photons, etc.—are created in the intense gravitational field. One particle falls into the black hole, while the other escapes. Since the energy from the black hole was the source of the newly created particles’ mass (via E = mc2), the black hole’s mass shrinks slightly with every escaped particle. Unfortunately, the event horizon temperature is low for black holes like the ones we see, so Hawking radiation is correspondingly much fainter than other sources of light. However, if very low-mass black holes exist, they would shine brightly by Hawking radiation, and decay relatively quickly, evaporating away to nothing. Watching such a black hole vanish might help answer the question of whether information is truly lost or just hidden from us by the event horizon. Interestingly, Hawking himself thinks the problem has been solved, at least in principle: Black holes preserve the information they swallow, much as a hologram preserves information about three dimensions even though they are two-dimensional pictures. His hypothesis, based on an idea in string theory, doesn’t yet work in our four-dimensional cosmos (three spatial dimensions plus time), but rather for an abstract, higher-dimensional universe. As a result, not everyone is convinced by Hawking’s demonstration, even if they agree that black holes don’t forget their origins. The nearest known black hole to Earth, which carries the highly memorable name V404 Cygni, is about 8,000 light-years away. While that’s a mere hair’s breadth in cosmic terms, it’s far enough that we can’t study it up close. (For comparison, Voyager 1—the farthest human-built probe—is a little over 17 light-hours away at the time of writing.) The closest supermassive black hole (one that exceeds a 100,000 times the mass of the Sun) is even farther away: 26,000 light-years. That’s the monster at the center of the Milky Way, known as Sagittarius A* (pronounced “A star”). We see black holes like V404 Cygni by the matter surrounding them: Material stripped off companion stars, for example, heats up as it orbits the black hole, emitting strong X-ray and radio radiation. Thanks to high-resolution observations made last year, astronomers have measured swirling gas at very close orbits to the giant black hole in the galaxy M87. And the dance of stars and plasma near Sagittarius A* reveals the presence of the black hole that helps keep our galaxy together. With continued improvements, we’ll be able to get an even better view of black holes, drawing ever closer to the event horizon. Yet nature still hides the mystery of what lies inside a black hole, perhaps forever. ~ Matthew Francis is a physicist, science writer, public speaker, educator, and frequent wearer of jaunty hats. He’s currently writing a book on cosmology with the working title Back Roads, Dark Skies: A Cosmological Journey.